The Stanley Cup arrived in Cornwall, Ontario on Tuesday, July 17, prepared for a day with assistant coach, Newell Brown. While playing junior in his hometown, Newell was part of a squad that captured the Memorial Cup in 1979-80, a team that featured Scott Arniel, Fred Boimistruck, Marc and Lou Crawford, Dan Daoust, Dale Hawerchuk and Bobby Hull Jr. After playing with the Royals, Brown attended Michigan State from 1980 to 1984, and served as captain during his final three years at the university. But as much as the word 'pride' comes into Brown's hockey lexicon, it also permeates his family history. Newell is the sixth generation of Browns to work the Cornwall farm on which they've lived since arriving from Scotland all those decades ago. When the Cup arrived at 10AM, Newell insisted on getting some photographs at the family's soy and corn farm where he spent so many happy times during his childhood. 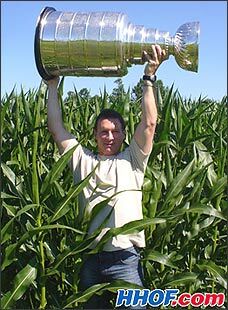 With the Cup situated in front of the cornfield, Newell orchestrated a family shot surrounding the trophy, not dissimilar to the on-ice shots taken around the Stanley Cup by victorious teams. On hand, among others, were his Dad Newell Sr., Mom Eleanor, wife Lori and the kids, Erika and Adam. 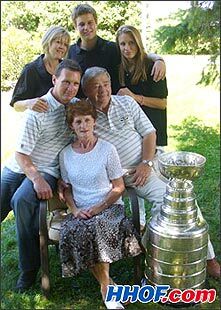 Brown's Dad Newell Sr., Mom Eleanor, wife Lori and the kids, Erika and Adam gather for a photo with the Cup. Brown took the Stanley Cup into town, arriving at the Cornwall Civic Centre just before noon. A presentation was made recognizing Newell's contributions to hockey both locally and in Anaheim. In turn, the Ducks' coach recognized the volunteers who had worked so diligently to make his day in Cornwall special. Newell was given a jersey and a set of hockey cards from the tourist bureau. Then, for the next two-and-a-half hours, Newell sat by the Stanley Cup as more than a thousand fans lined up to make a donation and then get a photograph. The line-up included jerseys from so many teams, including the Ducks, but there was more Senators and Canadiens representation than any other team. Makes sense: it's just over an hour to drive from Cornwall to either Ottawa or Montreal. The money raised, which totaled almost $2,500, helped kickstart a fundraising campaign that will see a four-pad rink built in Cornwall. The yard party went from 4:00 until 7:00 that afternoon. A special trailer provided hotdogs and hamburgers while in the distance, the skirl of a bagpiper's song paid homage to the Brown's Scottish heritage. Chad Kilger, a Cornwall boy playing for the Toronto Maple Leafs, arrived at the party and dug into a good-sized piece of cake. The party wound down at dusk, and about twenty friends and family members remained, sitting enjoying each other's company by the Cup. As the day turned to night, a fireworks display was presented, and a roaring bonfire kept the night going. The next day, July 18, the Stanley Cup traveled to Quincy, Massachusetts, the special guest of strength and conditioning coach Sean Skahan, his wife Hillary and their 14-month-old son, Will. "My family and all the friends I grew up with are right here," said Sean. "It never crossed my mind to keep it for a day in California!" The first stop was to Harvard Vanguard Medical Associates where Sean's mother, Marilyn, works. Photos were taken with the staff as a proud mother enjoyed the moment for her son. 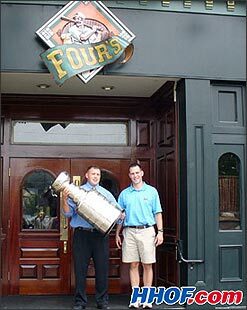 For lunch, Sean took the Stanley Cup over to The Four's, an excellent gourmet sports pub, and amused and amazed patrons crowded the Skahan family as photographs were taken. "They didn't know it was coming, so it was pretty neat to surprise everyone," smiled Sean. As someone once mentioned, it's important to look good in order to feel good, so the Stanley Cup next visited Squantum Cutters, meeting the stylists and barbers there. At 4PM, Sean took the Cup to John P. McKeon Post where his Dad, Ron, is a member, and followed that with a stop at the Robert By Nickerson Post, where family and friends met him and the Cup. A Quincy policeman came over to see the Stanley Cup, and Sean glanced at him for a few moments. "Hey, I remember you. You chased me once when I was little!" Both men laughed heartily. The Cup stayed at the Nickerson Post for three hours, but then was taken to a less traditional destination. A handful of friends joined Sean on a path that led into the woods and took them to 'The Rock.' "This is where my buddies and I hung out when I was playing football at North Quincy," Sean explained. Malachy's Saloon was the next stop, a place beloved by locals looking for a Guinness, a game of darts and great tunes on the jukebox. It wasn't the first visit to Malachy's for the Stanley Cup, because in 1999, Larry Kelly, the director of public relations for the Dallas Stars, took the Stanley Cup there when his team won the championship. As Sean and his friends entered the pub, Kelly came over and congratulated them. "I heard you were going to be here," Larry said. "Congratulations! Feels great, doesn't it?" Patrons paid for the privilege of getting a picture with the Stanley Cup, and all the money was donated to the Patrick Tevenan Scholarship Fund. A childhood friend, Tevenan suffered a massive coronary and died in March 2007 at the age of 29, and it was important to Sean that his friend be remembered. At midnight, a shuttle van took the party-goers and the Stanley Cup to the Baseball Tavern, just outside Fenway Park. In fact, the bar is so close to the home of the RedSox that the upper floor overlooks Fenway. "Pssst. Hey! You guys want to actually go in to Fenway?" whispered a visitor to the bar. "I know a guy who knows a guy who knows this other guy who can get us in. Come on!" 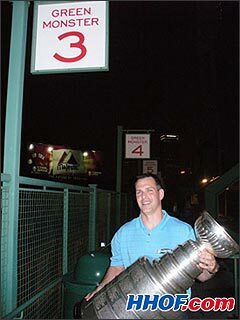 And sure enough, at 2:30 on that wonderful early, early Thursday morning (or late, late Wednesday night, depending on the perspective), the Stanley Cup sat on the Green Monster in Fenway Park, soaking up the sights of Boston and thinking about long blasts hit by Yastremski and Conigliaro back in the day. David McNab, the Ducks' assistant GM, was most anxious. His day with the Stanley Cup was scheduled to begin at 11:00AM on Friday, July 20 and he wanted to ensure that there would be no problems so he booked flights on three different airlines to ensure that the Cup would arrive in a timely manner in Yorba Linda, California. It was a good thing, too, as the original flight booked was delayed by three hours, so the Cup took a different flight and arrived in Long Beach rather than the original plan of landing in Los Angeles. But even then, there were anxious moments. The baggage carousel filled, circled, then emptied without any sight of the Stanley Cup. Finally, the last item to arrive showed up in its now-familiar blue case. The Stanley Cup  safe and sound! A limousine took the Cup to the Yorba Linda, California home of the McNabs  David, Kari and their girls, Ali and Erica. They took the Stanley Cup over to the East Lake Village Community Center where 150 invited guests enjoyed shrimp, chicken, salads, cheese and fruit while waiting for hockey's greatest prize. "Here it is!" 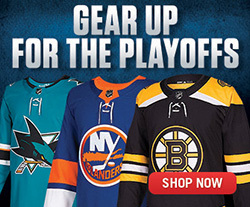 shouted one, as the Stanley Cup was carried into the recreation room. David made a brief speech, much to the delight of those invited to the celebration. "This day is dedicated to my wife and kids, without whom I couldn't enjoy days like this!" Kari beamed, the girls blushed and the crowd clapped enthusiastically. 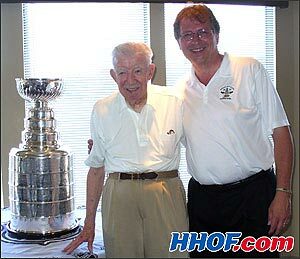 One of the invited guests was David's father, Max, himself a Stanley Cup champion with the 1950 Detroit Red Wings. Now a spry 83-year-old, Max McNab took a drink out of the Stanley Cup, leading the charge for all the guests to enjoy a celebratory sip. The McNabs enjoyed a buffet lunch at Marie Callender's restaurant, then returned home in order to have family portraits taken with the prize that David and the Ducks had so ably won. 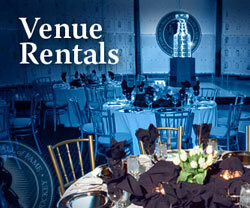 You'll want to join us Tuesday as the Stanley Cup Journal visits a party hosted by Chris Pronger. We don't want to say too much right here, but we'll reveal just two details: police and pannukakku. See you then!